In this review of Leaked Profits we prove that this program of Frank Bishop is a dangerous scam. Bishop claims to be a former Wall Street trader who created a profitable binary options trading app that can make you $1250 per day. And because money is free for everybody, you can get access to Leaked Profits for free. Isn’t life extremely simple? The reality is that Leaked Profits is a scam that will not make you any money. In fact it will force you to deposit money and then it will lose your deposit. Frank Bishop is a fictitious character played by an actor. He is a scammer. This guy certainly is not a real trader and he has not worked on Wall Street. First you have this fake article on CNBC that has never been published. You can search the CNBC website or check our picture. CNBC never published a single word about Frank Bishop! Then you have this fake book. It is only logical, as Bishop is a fictitious character, he could never have published a book. 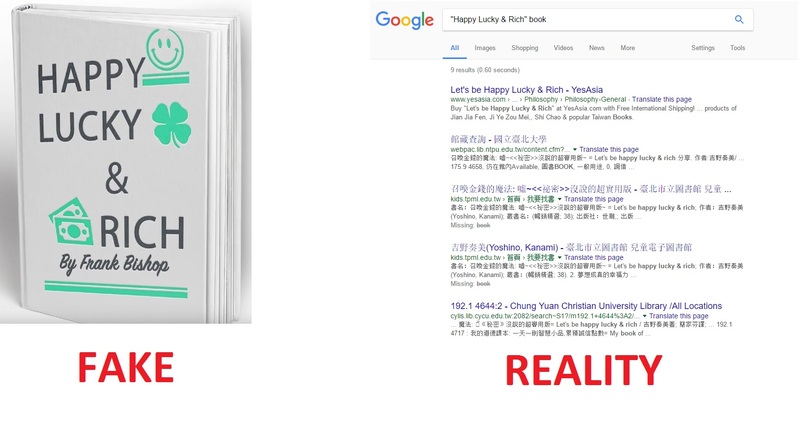 You can search Google for a book of this name (Happy Lucky & Rich) and you will find nothing. Look at the second image and you will see the proof. All the people you can see in the Leaked Profits video are paid actors, including those who present testimonials. Ale these reviews are fake, these people are lying for money, they have never traded with Leaked profits. You will find the proof on the picture. As you can see, this woman sells fake testimonials on Fiverr for 5 dollars. We tested the Leaked Profits software to see what scammers came up with this time. And we found a very well-known software used by scammers only. It has been used by countless scams, look at the picture to see a few examples, like Hexa Trader, Profits Perpetual or Binary Options Millionaire. We know from real user that this software loses money in real trading! Now let us explain how Leaked Profits really works. After registering you will have to deposit at least $250 with an unregulated broker that will be selected for you, you will have no choice. The reason is that these scammers are getting paid by this broker for referring new depositors. That’s how scammers make money. If you deposit money with Leaked Profits and let the software trade with your money, you will lose it. End of sad story. Leaked Profits is disgusting scam that is made to lose your money in trading with a worthless software. So stay away from it! If you want to see how real money is being made in binary options trading, try a free demo account with a regulated broker. On the demo you can learn to trade profitably. Only then you can start trading with real money for real profits.